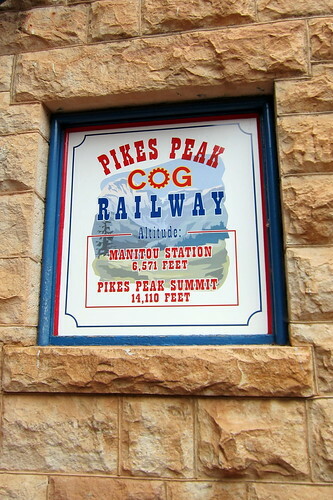 Pikes Peak is scalable via automobile or via the the Manitou and Pike’s Peak Railway, also known as the Pikes Peak Cog Railway, an Abt rack system cog railway Pikes Peak Mountain. The railway starts at a depot in Manitou Springs, with an altitude of 6,571 feet, and reaches the summit at an altitude of 14,110 feet, making it the highest railway in North America by a considerable margin. Its tracks climb at an average 16% grade, but reaches a maximum of 25%. The railway was started by Zalon G. Simmons, inventor and founder of the Simmons Beautyrest Mattress Company, in 1889, with limited service to the Halfway House Hotel starting in 1890, and summit access beginning in 1891. Originally, steam locomotives were built for the line, but operation was physically and financially challenging. Gasoline-powered internal combustion engined trains, believed to be the world’s first rack railcars, were used starting in 1938, and in 1939, diesel locomotives were introduced. In 1964, the rail turned to the Swiss Locomotive and Machine Works who supplied two bright red cog railcars, which eliminated the need for a separate pushing locomotive. Today, the railway owns enough cog equipment to run six to eight trains per day and in 2006 began running year-round service. A cog railway, also known as a rack-and-pinion railway or rack railway, runs on a toothed rack rail using trains fitted with one or more cog heels or pinions, allowing the train to operate at steep gradients. With few exceptions, most rack railways are mountain railways. The Abt System utilized by the railway was devised by Roman Abt, a Swiss locomotive engineer, in 1882. Using solid bars with vertical teeth machined into them, he improved over the earlier expensive Riggenbach design. Pikes Peak is, at 14,115 feet in altitude, the one of Colorado’s fourteeners, and the easternmost of fourteen thousand foot peak in the United States, located 10 miles west of Colorado Springs. Originally called "El Capitan" by Spanish settlers, the mountain was renamed Pike’s Peak after Zebulon Pike Jr., an explorer who led an expedition to the southern Colorado area in 1806. This entry was posted in Colorado and tagged Colorado, Peak, Pikes, Railway. Bookmark the permalink.